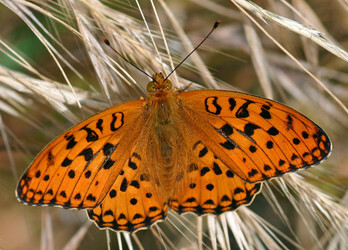 The North American representatives of the Holarctic genus Argynnis have for some time been placed in the genus Speyeria. The recent morphological work of Simonsen (2006), combined with the molecular data of Simonsen et al. (2006) suggest that the remainder of Argynnis is paraphyletic if Speyeria is retained as a distinct genus. 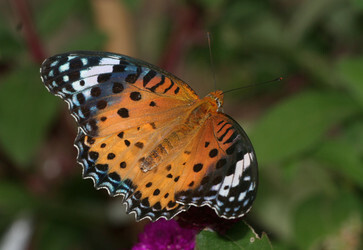 The name Argyreus, although older than Argynnis, was suppressed by the International Commission on Zoological Nomenclature to preserve stability of usage of the latter when the two are considered synonymous, as they are here. Page: Tree of Life Argynnis Fabricius 1807. Speyeria Scudder 1872 currently viewed as a subjective junior synonym, Argyreus Scopoli 1777 suppressed by the ICZN as having priority over Argynnis. Authored by Niklas Wahlberg and Andrew V. Z. Brower. The TEXT of this page is licensed under the Creative Commons Attribution License - Version 3.0. Note that images and other media featured on this page are each governed by their own license, and they may or may not be available for reuse. Click on an image or a media link to access the media data window, which provides the relevant licensing information. For the general terms and conditions of ToL material reuse and redistribution, please see the Tree of Life Copyright Policies.